Painkiller has been a reviewer before. From metal music to mash-up music. However it really took off when, one day PK tried some Pizza Beer, and he HAD to film himself drinking it. From there the reviewer for Craft beer was born. PK then came up with a plan, to bring it to the world but have it on his terms, on his turf, and even now, on a webpage that he can almost call his own. Over time Johnny Oldschool was introduced into the fold as his co-host and things really took off. 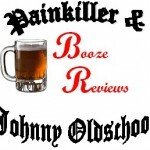 Now over a year into it Painkiller's dream of having a website dedicated to Booze is here! He is happy to share it with you all! Come take the journey of a life time as we Eat, Drink and Be Merry!